Whether you are looking to buy a house, a new car, save for a holiday or simply put some money away for a rainy day, saving is a vital part of financial success for anyone of any age. Yet why is it that some people seem to be so much better at saving money than others? Is it to do with their upbringing? Did they have special savings goals set for them from being young? Or do some people just have an inbuilt genetic ability to be good savers? The following infographic produced by Zopa gives an interesting take on some common financial decisions we all make in life. 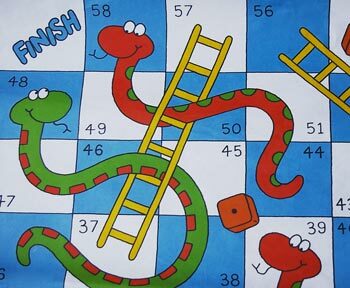 It’s based around the classic game of Snakes and Ladders and highlights some of the best and worst financial decisions you could make in your quest for a healthy bank balance. There are some really great points on here actually, here’s one that I liked. Buying a house with getting a proper survey – When I bought my first house it was just before the financial crash and it was almost impossible to fail to make money on a property. I was young and inexperienced and had also watched far too many property programs. I had it in my head that I would buy a property that needed modernisation and then sell it a few years later for a handsome profit. As I already knew that the house needed work I opted for a basic survey for mortgage purposes only. The survey did recommend getting further reports like a roof report and an electrical report but being young, stupid and eager I didn’t see the need for any of that and just went ahead and bought it. When I got stuck into renovating the house I realised that it might not have been the wisest move I’d ever made. The house needed a complete rewire, the roof was completely shot and there was a huge hidden patch of damp that fortunately was only being caused by leaking gutter. In some ways it worked out ok because it meant we had to do a thorough job with the renovation and leave no stone unturned but the costs were a lot higher than I’d initially envisaged. I did learn my lesson though. If you’ve read money bulldog much in the past then you probably know that I’m not a great fan of Homebuyer reports but if you can afford the investment of a full survey then I would definitely say they are worth the extra cash and could save you a lot of money in the long run. The infographic uses Electrical wiring as an example and it’s a good one because unless you’re content to have a load of boxed in wires on show the cost to rewire and then redecorate afterwards could be astronomical. Something to consider. Anyway that’s enough rambling from me, hope you enjoy the infographic! What Factors Determine Financial Comfort? Wow, it’s really sobering to see that so many people listed saving for vacations/holidays as their number one financial priority (although I guess you could say that it’s better to save for that than put it on a credit card!) Especially when it seems to be higher priority for some than all those other things like retirement, emergency fund, etc. Surely some of the 2,000 people surveyed would that they don’t save at all or they are paying debt if the sample was a true reflection of society?